Over a decade, India’s digital presence has been mounting up like never before, touching almost all the fields of society, let it be banking, education, healthcare or governance. With the progression of time, lots of changes have been made into different aspects of Indian governance including Labour Laws. Today, technology- based governance is ruling the entire industry and with regard to that several labour law procedures have become digital. Almost all compliances such as PF, EPF, and Gratuity Fund are supposed to carry out online compulsorily and these compliances have become time-bound in terms of Due Dates prescribed in particular Acts/rules. These inter-connected procedures demand a healthy mix of expertise on both digital landscape as well as labour laws. 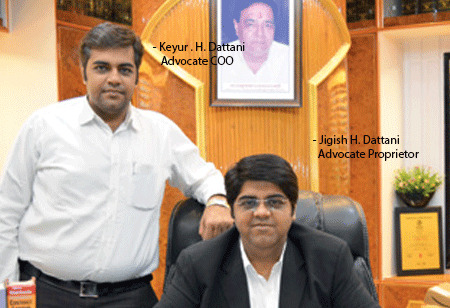 Acknowledging this market requirement, Dattani & Dattani, a highly reputed Labour Law consultant in Gujarat provides practical solutions in respect to various HR and labour law compliance and optimizes client’s business performance through up- to-date digital resources. With a continuous endeavor to update themselves with the latest knowledge and the fast-moving in dustry trends, the team Dattani & Dattani has served more than 400 satisfied clients till date at both national and international levels. Some of the reputed companies in their client list are Reliance Industries Ltd., Nayara Energy Ltd. (Formerly Essar Oil Ltd.), Adani Power Ltd., Bharat Oman Refinery Ltd., and Gallantt Metal Ltd. “Started with a small premise within 150 sq. fts in 1956 by Late Shri Karsandas M. Dattani, today our firm has turned to be the highest practicing Labour Law Consultant in entire Gujarat. More over, Dattani & Dat tani has been honoured by Bharatiya Vikas Ratan Award, 2007 from Achievers Society for Technology & Social Development, New Delhi and Best India 5000 MSME Firm Award by Benchmark Trust. In future also, we will continue to give our best services to our clients. Our vision is to expand our presence in entire Gujarat and cater our clients more efficiently and quickly from various locations,” Jigish concluded.